This is a reprint of the featured essay from Exploits #7, our magazine dedicated to the culture we love. If you like what you see, grab the magazine for $2 or subscribe to never miss an issue (note: Exploits is free for subscribers of Unwinnable Monthly). Over the summer of 2018, Childish Gambino’s “This is America” became the kind of song that blows up, whose refrain gets stuck in your head, even if it doesn’t have the kind of radio play of a Maroon 5 song. Bound in metaphor, the video was perhaps as big a hit as Gambino’s vocals – This is America/Don’t catch you slippin’ up. 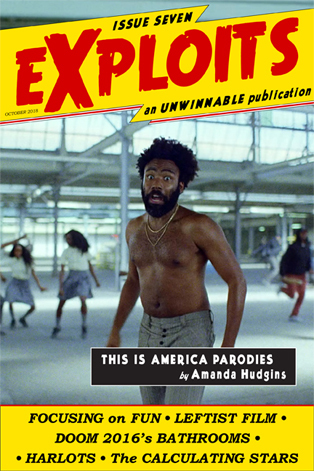 Ill-fated parodies abound, but among the failures there is a more interesting facet – people from other countries telling their stories in the format of “This is America.” There are the positive takes (“This is Malaysia” is perhaps the best example of this) where the main vocalist makes jokes about the cuisine and being confused for other countries. Then there are the ones that take to the core of Gambino’s hit single – a dire warning – and run with it. “This is America” is a warning, a call to the listener to understand that life in America, as a black man, is a tenuous thing. That there are risks waiting around every corner; Yeah, this is America/Guns in my area/I got the strap/I gotta carry ‘em. In keeping with that, other national variations touch on the same elements, but flavored like a local cuisine. There are versions for several countries, from Iraq to Barbados, but one of the most interesting is “This is Nigeria.” The good ones, the serious ones, they’re warnings about the insecurities of their governments and the failures therein – the cops that will shoot you in the street, the governments that won’t track down missing children, not having financial security, etc. “This is Nigeria” is emblematic of this. The video, put up by Nigerian rapper Falz the Bahd Guy, begins with a radio announcement from his father (a social justice lawyer) talking about colonialism, and as the song continues features the consistent refrain is This is Nigeria/Look how I’m living now/Everybody be criminal. He talks about government corruption, a case where a Nigerian official said $36 million dollars was eaten by a snake in her office and the questionable sources of money for popular figures in social media and government. The videos are takes as well on Gambino’s metaphor-laden video, substituting elements from the original to suit the cultural differences. Perhaps the most distinctive in this regard is “This is South Africa,” which is the first video I encountered where the creator swapped out the man sitting in a chair playing a guitar this time having it be a woman in a bright, floral dress. Her appearance is important, “This is South Africa” dedicates most of its screen time to talking about the danger women face in South Africa. These songs are a different creature than Gambino’s original, but it’s a warning and a condemnation just the same. This is our home, they say, and you have to watch out.